Welcome to Australia New Zealand Regional Conference 2018! There will be an exciting program designed by doctors – for doctors interested in breastfeeding medicine. Dr Sarah Reece-Stremtan, Paediatric Anaesthetist, Washington DC, USA. 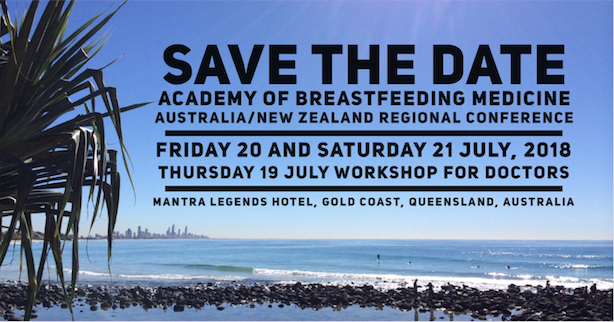 “The Effect of Maternal Anaesthesia and Analgesia on Breastfeeding Infants"
Dr Nikki Mills, ENT, Auckland, NZ. Professor Leonie Callaway, Senior Specialist in Obstetric and Internal Medicine, Brisbane, Australia. Dr Gillian Opie, Neonatal Paediatrician, Mercy Hospital for Women, Melbourne, Australia. “Breastfeeding the IUGR and lat preterm infant"
Dr Linda Martin, Dermatologist, Sydney.